In Aging Out of Place, we talk to seniors who’ve said no to aging in place and yes to digging up roots and replanting themselves someplace cheaper, warmer or easier. Or all three. In 2009, at age 65, Jill Cotter found herself living alone in a tiny apartment in Manhattan’s East Village and longing for a last adventure. Twice-divorced and recently retired, she had never been one to stay put; Jill had worked as an elementary school teacher, an actors’ agent, a Wall Street investment analyst and the director of a Marxist school. For the last few years before retiring, she’d been organizing trainings and workshops for solar-energy installers at City University of New York. Then changes at work forced her to quit. Now what she wondered? All she knew was that she wanted to leave NYC. As a young woman, Jill traveled all over Europe by herself and lived alone in New Guinea for a few years as a teacher; solo travel didn’t intimidate her. She’d been to the Yucatan in Mexico a couple of times and was interested in Mayan history, but she didn’t want to live in Mexico. Belize, just to the south – also part of Mundo Maya – appealed, partly because it is English speaking (Belize is a former British colony, now culturally Americanized). 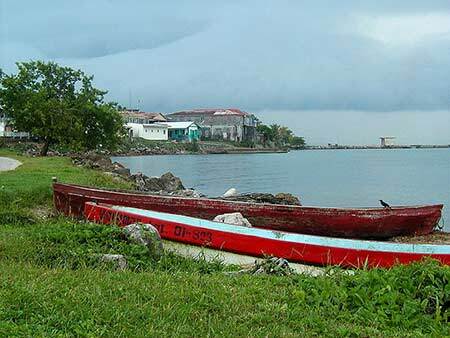 So she settled on Punta Gorda, Belize’s southernmost town – known locally as PG. Not far from the Guatemala border, PG is a fishing town that lacks a reef to attract tourists and divers, though visitors from around the world pass through en route to Mayan adventures. The only populated area in the south of the country, the town is remote and peaceful, while still having a small expat community. It’s relatively inexpensive, which allows Jill to live comfortably on her Social Security and a very modest pension. She has no plans of leaving Belize anytime soon. Jill had just celebrated her 70th birthday and was visiting her brother and friends in New York when we met with her to learn more about her adoptive home. How did you prepare to move to Punta Gorda? Did you know anyone there? No I didn’t, but while I was still working, I was going down and visiting Belize and making friends there. I picked Punta Gorda because I wanted to live in a regular town with locals who had their own lives whether foreigners were there or not. There are 36 Mayan villages near Punta Gorda and they speak English. Finding an inexpensive English-speaking foreign country with a warm climate is not easy. What is Punta Gorda like? It’s a poor town of 6,000 people. There’s not enough work, garbage collection is spotty, streets have potholes, many people live in shacks. But there’s a middle class that is doing pretty well. People work in banks, for government or NGO’s. And it is beautiful. We’re right on the Bay of Honduras and it’s surrounded by bush, monkeys, birds. You can kayak, and there’s good fishing. PG appeals to folks who want to buy land, plant fruit trees and raise chickens, and who don’t care what they look like. A softer experience can be found in the beach resort Placencia and up north in Orange Walk, where they even have a gated community. My town has end of the line appeal. People like it because the road doesn’t go any further—it literally ends here. Is it easy to make friends? As a single woman that’s got to be important. Yes, you need friends because there’s nothing else to do. There are a couple of hundred expats spread out around the countryside, and tons of people among PG’s middle class have lived in the States. The best way to make friends is to volunteer – at the humane society, the library, NGOs. There’s also a breakfast place called the Snack Shack where expats go for breakfast and catch up on gossip. People are very accepting. How do you keep busy there? When I tried to think of what to do in PG I remembered how wonderful it was to work with little kids. It’s also a great way to get to know local people – through their children. Otherwise, it’s much more difficult to get to know locals if you’re a foreigner. So I started right away volunteering in the school and turned it into a full time job. I’m the librarian, and I have a library and a reading program where teachers in lower grades send me kids to help. Then I branched out into arts and crafts because the kids don’t have a creative outlet. And someone turned me on to a couple of NGOs who collect books, so I’m always getting boxes of books. I share them with the library in town. What’s the best thing about living in Punta Gorda? You don’t need a car. For someone like me who had to take the subway everywhere, I can walk to everything or ride my bike. I also love the small town atmosphere. Every morning I have breakfast in the same place, see my friends and hear the latest gossip. It’s very informal. I live right in town on the same street as the market, so friends are always dropping in on me. I like that there’s not much going on, because you do appreciate every little thing that happens. No one cares about clothes, there’s nothing to spend money on. There’s nothing to do on Sunday. Culture is minimal. There’s a lot that expats could do, like start a theater group, but they don’t. The activity happens around certain holidays, when there’s a lot going on. When the Garafunas [descendants of the indigenous Arawak Indians and West African transplants) celebrate settling in Belize, there’s a month of drumming and dancing. The locals love parades. It has a charm, but it can get boring. The only activity is going to visit friends. You have to find your own entertainment. How long do you see yourself staying in Belize? I used to want to go places and travel a lot, but somehow once I got to Belize I lost the travel bug. The kind of travel I’m interested in now needs to have a reason: to visit a school, or see the political makeup of a country. I don’t want to move back to the U.S. – one reason is the government’s economic and political policies; its wars and total disregard for humanity – but my health might force me to someday. Living in PG with any kind of chronic condition is not recommended. The local hospital in PG can only handle simple ailments; serious stuff gets sent up to Belize City. Many expats go to Mexico and Guatemala for healthcare. Right now I’m in good health. I have Medicare, and I come to New York every year to get checked up. Maintaining my energy for life. Enjoying what I’m doing. Getting excited and enthusiastic about it and wanting to communicate with everyone around me. Reaching out and being with people. Cost of housing: Moderate The Belizean currency is tied to the U.S. dollar and rent is not cheap – Jill pays $750 per month for a spectacular split-level house overlooking the ocean. Rent in town for a Belizean-style house can run much lower, around $300. Some people buy land and put up their own houses. Crime scene: Watch your purse In much of Belize there’s thieving – you can’t leave anything around – but no violent crime. Belize City has a lot of drug related violence. Expat community: Small but friendly Many of the 200 or so expats are interested in sustainable agriculture and new-age holistic health and spirituality. Climate: Mixed bag It can be extremely hot during the summer months, nice during the winter. Taxes & discounts Belize’s Qualified Retired Person program offers incentives for foreign seniors, including a permanent exemption from all Belizean taxes, and tax-free importing of personal goods, vehicles etc. Civil Rights The democratically elected government is corrupt but not oppressive. People are poor, but it doesn’t stare you in the face. I was actually trying to google the details and happenings of a small town in Florida called Punta Gorda and wound up here. Nice story and interesting. Typical NY’er..run out of town due to the high cost of living (I see retirement outside of NYC on the horizon for myself as well) and then complain you will never return because of its ‘wars and policies’ yet keep your US passport and remain a citizen so that you can collect your social security plus return for the healthcare system here. I would respect this more if it did not knock the US (from whence she came). Oooh, so interesting! Terrific article, Erica, and Jill is inspirational too. So much energy and good spirits. Wonderful to read about her life in Belize. I remember meeting Jill 40 some years ago, and she is recognizable to me still. What a life she’s lead. Remarkably varied and now a small village at/for the end of the line. I share her wanting to throw off the necessities of city life, like pulling oneself completely together just to go get milk. Her life now sounds like it had a seamless, appealing quality and the fact that people get together for breakfast and conversation, face to face like the old days in the city sounds nourishing indeed. Would love to read more retirement stories like this. I met Jill in New York last summer and was totally impressed by her adventurousness, her joie de vivre, and her carving out a new, satisfying life for herself. It’s wonderful to read this article showing how well things are working out for her.